HotHouse worked with the Maritime Museum on the first large-scale exhibit on the legendary Edmund Fitzgerald. Aside from telling the story of that fateful night on Lake Superior, the exhibit focuses on the people who worked on the ship. Thanks to artist/craftsman Gordon Manary for building the signage boxes, mounting the flag, and installing all the pieces of the exhibit along with sign fabricator ShelDon. The Shipwrecks Alive! exhibit opened at Great Lakes Aquarium on July 2nd. HotHouse worked closely with the Aquarium to design all the interpretive signage for the exhibit, along with the logo and marketing pieces, and the design of a 40 foot long photo collage and the look for the SCUBA history wall. Logo and example of interpretive signage developed for Great Lakes Aquarium "Shipwrecks Alive!" exhibit. Coming Soon poster and pull-up banner were created for Great Lakes Aquarium's "Shipwrecks Alive!" exhibit. This large banner hangs on the exterior of Great Lakes Aquarium to advertise the exhibit. One wall of the Shipwreck's Alive exhibit is devoted to the history of SCUBA diving and wreck exploration. HotHouse designed the two-part wall layout. The two sections are joined by a case holding an antique SCUBA suit. Another example of the exhibit signage - this is one of a series of 11 signs that show how marine life takes over a shipwreck over time. The close-up reveals the hand-drawn marine life that HotHouse illustrated on each sign. Visitors enjoy the Shipwrecks Alive! exhibit at the opening on July 2nd, 2014. The SCUBA wall is featured in the background. This is the History of SCUBA Diving wall in the Shipwrecks Alive! exhibit. A dark grey wall highlights a large quote and contrasts with the vibrant blue used on other walls in the exhibit. HotHouse designed this photo mural collage that recreates the wreckage landscape of the San Francisco Maru in the Pacific Ocean and surrounds the tropical fish tank. Artist Gordon Manary built this 3D Boat Materials Station, featuring lift-up panels showing how boat materials deteriorate in the water. Graphic panels designed by HotHouse. HotHouse enjoyed attending the Shipweck's Alive! opening. Featured in the background is the multi-panel section of the exhibit that shows how marine life grows on ships over time. 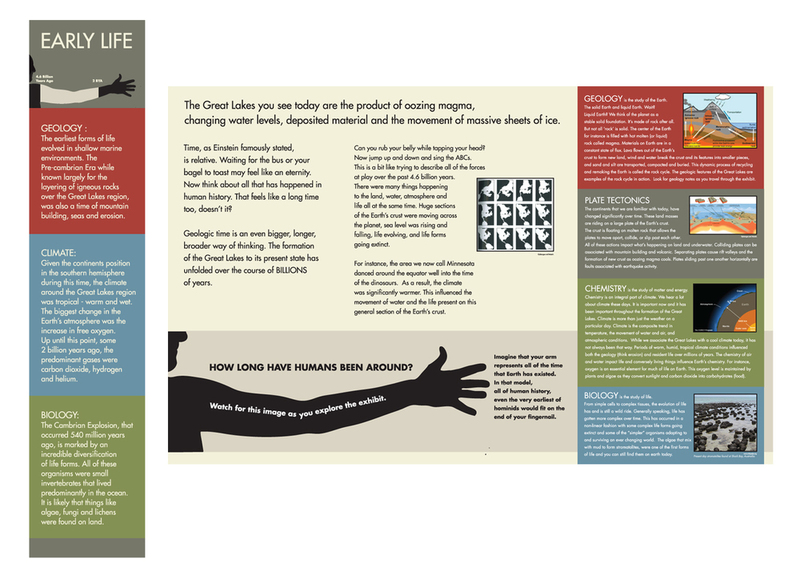 HotHouse worked closely with Great Lakes Aquarium in developing the interpretive signage for their most recent exhibit, Fire, Ice & the Rise of Life. Here are a few examples of the signage. We used the length of a human arm as a timeline from the beginning of the earth to present day. Sculptor, builder and craftsman Gordon Manary installs the 3D exhibit in the lobby of the Western Lake Superior Sanitary District. 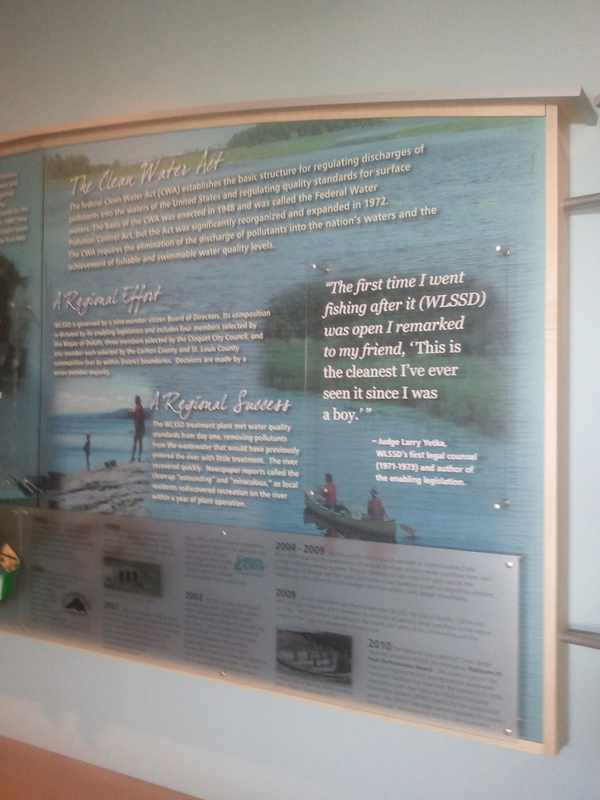 HotHouse designed the permanent lobby exhibit, which tells the history of the St. Louis River and the Sanitary District. HotHouse collaborated with Manary, who built the exhibit display and created the sculptural elements of the three-dimensional timeline. The golden shovel marks the groundbreaking of the Sanitary District on a timeline that runs the length of the exhibit. 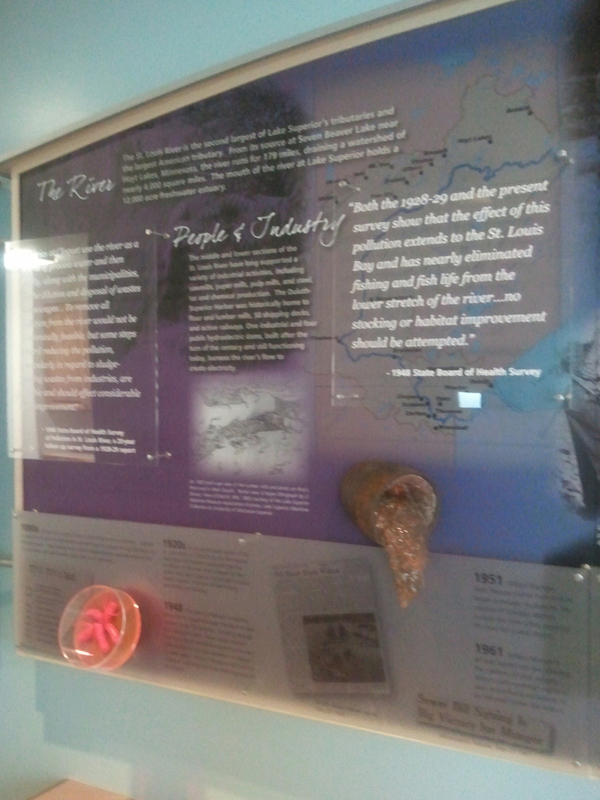 Other three-dimensional objects that mark the timeline include a petrie dish featuring magnified typhoid bacteria, and a water pipe dumping pollution into the St. Louis River.